Kusuri Wheatgerm – a very high quality fish food which was scientifically developed at Exeter University in the late 1990′s. Three years research undertaken by PhD students discovered that the addition of Kusuri Klay improved digestibility by up to 22%. This is the reason coupled with the other high quality ingredients that Kusuri’s Premium, Multiseason and Wheatgerm have incredibly low levels of fish waste. Promoting optimum health and growth. Kusuri Wheatgerm has been especially formulated, now with increased Garlic and is Wheat flour free, to also aid digestibility. 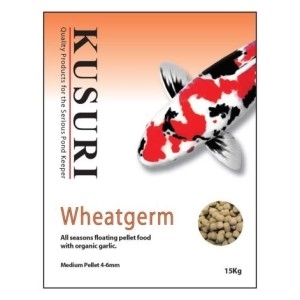 Kusuri Wheatgerm formula contains the high nutrient ingredients included in the Premium formula, such as Krill, Kelp, Garlic, Propolis and Optimum. Wheatgerm feeds can of course be fed at any time, but are particularly popular during autumn, winter and early spring when pond water temperatures are low and a reduced feeding is adopted. With this in mind, Kusuri Wheatgerm has been scientifically developed to include a high level of quality vitamins, minerals and a product called ‘Optimum’. Optimum is a proven natural additive that stimulates resistance to disease, infection and helps promote cell growth.